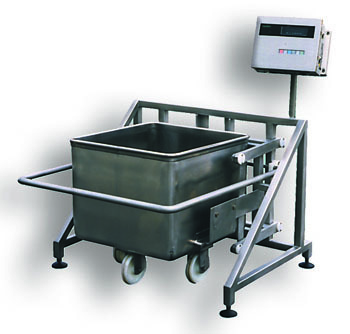 KG lifting and tipping device SKV 300 C3T, usually called a mobile single column lift, is used mainly in the food industry in order to lift and tip the standard 200 or 300 litre buggy into forming machines, fillers,grinders, mixers etc. 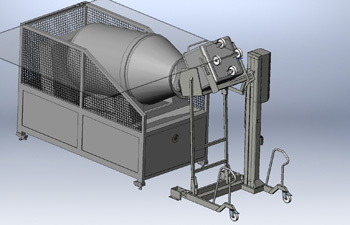 This single column lift can be manufactured to suit barrels, small containers or other fields of applica-tion. 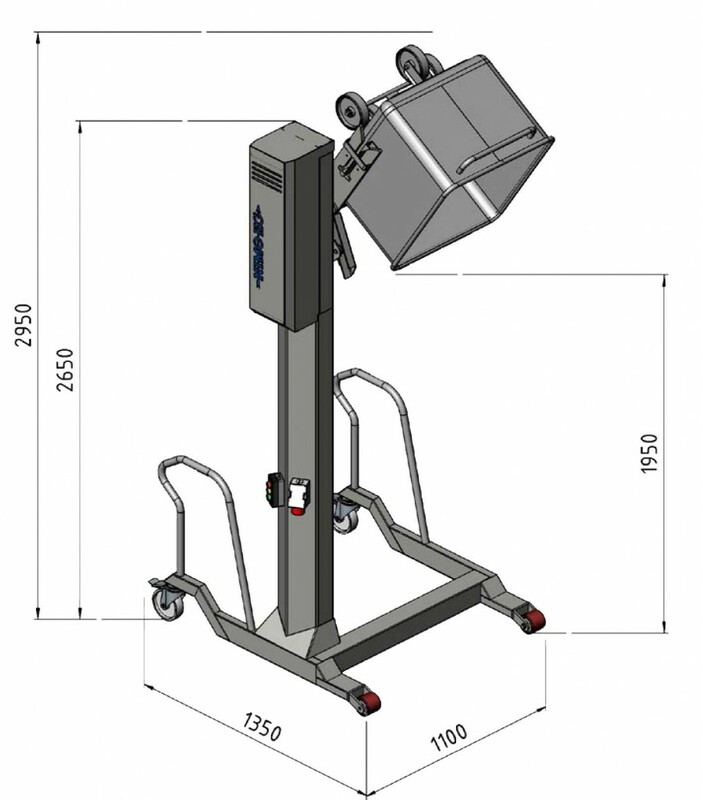 It can also be used in other industries such as chemical, pharmaceutical and engineering workshops.The single column lift is designed to comply with ergonomic demands to avoid elements of risk of injury to personnel and to make production more efficient. The design consists of 3 main parts, column, steering guide and lifting frame. The column is formed from plate and attached to the bottom frame, which is constructed from fully welded single hollow section. The bottom frame is provided with two fixed low front wheels and two swivel braked wheels. The lifting frame is mainly constructed from fully welded single hollow section and is fixed to the steering guide, which runs inside the column. The vertical movement is effected by electro-mechanical driving a roller chain. The container to be tipped is positioned into the lifting frame and for safety reasons the lifting frame is provided with a retaining mechanism, which secures the container in position.The single column lift is driven by an electric gear box motor with brake. The operation is controlled by electrical push buttons where the “up”-button is used for lifting and tipping and the “down”-button for the return to the floor level. The control box is provided with an emergency stop button. The tipping movement starts when the lifting frame is guided into the tipping roller, bolted to the column, and simultanously the steering guide continues upwards in the column. For safety reasons all driving- and operating functions are fully enclosed and guarded to prevent accidents. Furthermore, the steering guide is provided with a chain safety device, which prevents the container from falling down, in case of a chain break-down. 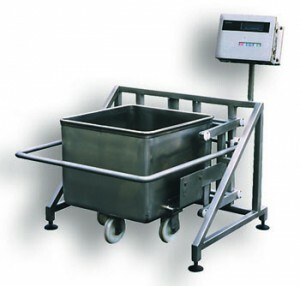 The tipping device is designed according to claims of the food industry authorities and complies with the following CE-norms: 2006/42/EC, 2006/95/EC and 2004/108/EC, as certified in the declaration of conformity, which is enclosed in the CE-documentation. For technical data and dimensions see separate manual sheets. Special offers on request. 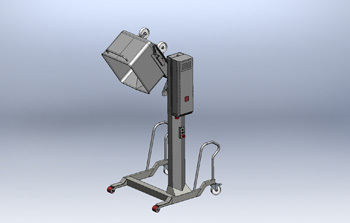 The main parts of the single column lift are manufactured from glassbead blasted stainless steel, AISI 304 (SS2333). The bottom frame is provided with wheels of nylon, which are suspended in brackets of stainless steel. Two fixed front wheels (height 90 mm) and two swivel braked rear wheels. The lifting frame rotates on the steering guide with two high density plastic bushes.Inside the column the steering guide runs on four wheels manufactured from high density plastic. The steering guide is manufactured from stainless steel.The tipping roller manufactured from high density plastic rotates on a stainless steel shaft, which is bolted to the column. The braked gear box motor has gears for best efficiency.The transmisson is effected by one-part 1″ Simplex roller chain from steel, BS 228-1962 (SMS 1613). The roller chain is fixed to the steering guide with link details from stainless steel. (As an optional extra, the chain and chain wheels can be manufactured in stainless steel). The single column lift is provided with electro-mechanical limit switches in order to stop the up and down motion. The push button box has electrical buttons for the operation of the up and down motion, with an emergency stop. Building form of the gear: B5. Voltage: 400/230 V, 50 cycles. Control voltage: AC 24 V, 50 cycles. Operating side: right (as optional in left hand design). Max. lifting capacity: 350 kgs incl. container.